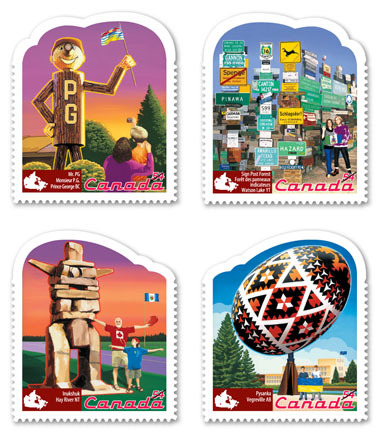 On July 6th, 2009, Canada Post began issuing a new series of stamps highlighting various roadside attractions across Canada. A Canadian road trip can be an exciting scenic experience. This year however, we celebrate the quirky manmade attractions which have delighted drivers for many years. First up is Mr. PG, an 8 metre tall log man which welcomes travellers to Prince George, British Columbia. He is the official mascot of Prince George and has been standing proud at the crossway of Highway 97 & 166 since 1960. Next, we visit the signpost forest in Watson Lake, Yukon. It has been estimated that over 64, 000 signposts have been put up by various individuals over the last 67 years. It all started in 1942 when an American G.I. put up a signpost indicating the way to his hometown. The tradition continues down to this day. Our journey continues to Hay River, Northwest Territories. In 1978 a giant Inuksuk was built to mark the Arctic Winter Games. Since ancient times an inuksuk has been used by the Inuit as a point of navigation or marker. It reminds us that various aboriginal tribes first inhabited this land. This stamp journey ends in Vegreville, Alberta where the largest Ukrainian Easter egg in the world marks the entrance to Elk Island National Park. It is an appropriate symbol for the area since a large percentage of the community can claim a Ukrainian heritage. It was built in 1974 to commemorate the 100th anniversary of the RCMP.